This new office building was experiencing widespread leakage since its construction due to fundamental exterior envelope design flaws. PL:BECS performed extensive water testing to confirm specific leak entry pathways. Extensive leakage manifested via widespread ceiling stains and interior dripping. Client: Lynnwood Corporate Center 2 LLC. Project Summary:	This steel-framed building consists of 4 levels of offices over a post-tensioned concrete-framed garage base. Exterior walls are primarily clad with stone tile, with curtain-wall and store-front window systems. 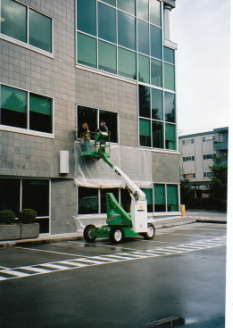 Widespread and persistent leakage began affecting the exterior walls since the building’s completion in 2000, and resisted corrective attempts. PL:BECS Services:	PL:BECS provided services in four phases. The first consisted of an overall evaluation of the building’s exterior systems, including store-front and curtain-wall windows, tile cladding, and sub-grade concrete walls. This evaluation revealed that most leakage resulted from fundamental flaws in the design of window flashings, which were improperly configured, and lacked any drainage provisions. This was exacerbated by an inherently vulnerable exterior tile cladding assembly. Additional leakage was also occurring at sub-grade walls, which had experienced cracking due to post-tensioned creep. In the project’s second phase, PL:BECS provided expert witness testimony in support of the owner’s effort to be reimbursed for these flaws and allow corrective work to proceed. Next, PL:BECS developed a limited-cost approach for corrective work, and prepared construction documents and specifications defining this work. Finally, PL:BECS provided limited construction oversight and testing related to the corrective work. In-progress testing indicated that the corrective approach proved effective even under severe wind-driven rain conditions. The PL:BECS report included detailed, color-coded maps locating numerous observed flaws responsible for widespread leakage.